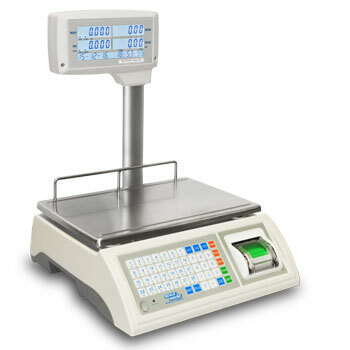 ASGMP retail scales for shops and markets. Digital scales fitted with customer's side display. 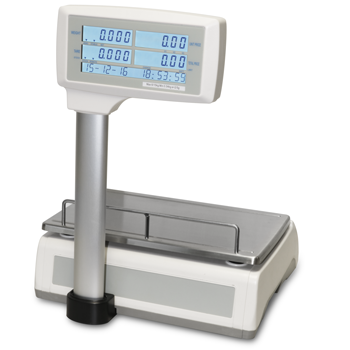 Retail scales with double precision interval, column and built-in thermal printer, for commercial use. Thanks to the long-lasting internal battery and to the 3 operators management, this scale is particularly indicated for selling in outdoor markets, due to the possibility of serving more customers simultaneously. The program also offers the imports totalisation function and a PLU memory with keyboard shortcut. These retail scales are fitted with 3 backlit LCD displays on column on the operator side, and 3 LCD displays on column on the customer side, with 20mm-high digits, for simultaneous indication of weight, price and amount. Mechanical waterproof alphanumeric and functional keypad, with 50 keys and acoustic feedback. Built-in rechargeable battery (about 70h life) and 230 Vac power adapter. Fitted with built-in thermal printer: 70mm/sec print speed, 8 dot/mm resolution, 384 dots per line, 58mm paper width, 50mm diameter roll. Packaging: dimensions 410 x 375 x 180mm - weight 10kg. - Dual interval CE-M approval (with Periodical Verification included, 3 year validity).